It's taken me until mid-March for my first F.O. (finished object) of the year. This is primarily due to the fact that I've taken on larger projects such as sweaters and afghans. I have plenty of knitting on the needles and it feels good to finally finish something. 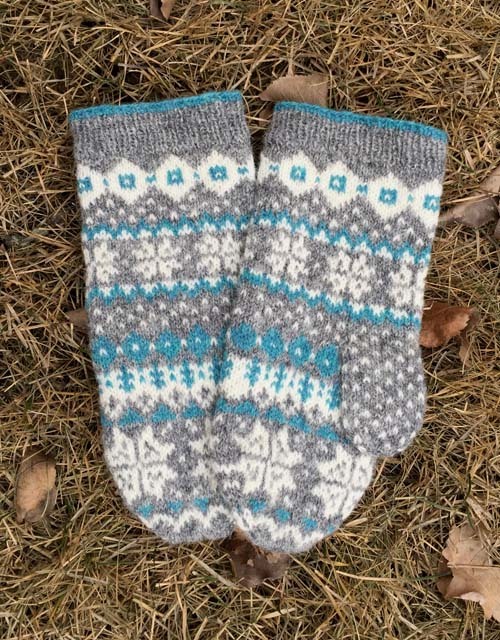 I joined a group on Ravelry, The Sweet 16 Knitalong [you'll likely need to be a Ravelry member to access this link] in which the goal is to make 16 stranded items in 2016. I joined for fun even though the chances of completing 16 is highly unlikely. It's a start, however. The Winter Snows Mittens were a knitalong project. It's by the same designer who created the Mini-mitten Advent Garland, which I'm still working on and enjoying. 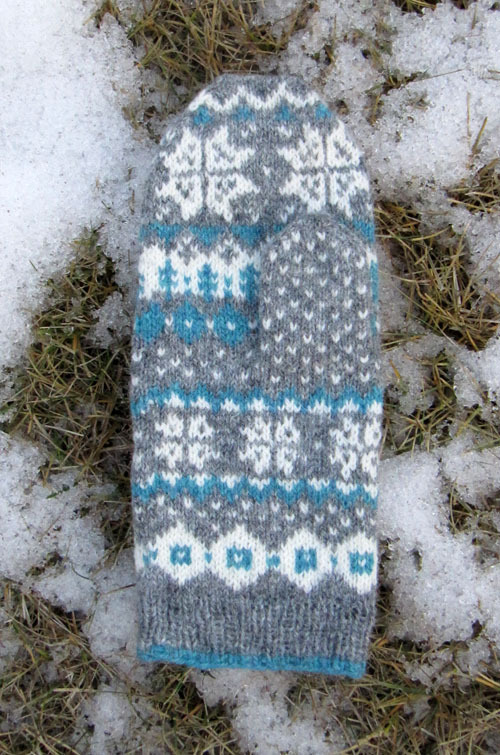 I wanted a shorter, more close-fitting mitten: worked to round 83, started decreases as on the longer option (for the small-size mitten) on round 84. Continued with pattern but did decreases to round 97 - no dots on round 96. Added 2 more rounds of decreases, in gray, to round 98 to end with 22 sts. total. Thumb: Keeping continuity of the fair isle patterning, did not knit rounds 21 and 26 inclusive. Notes: This is a good, well-written pattern and I would use it again as a template for mittens in the future.